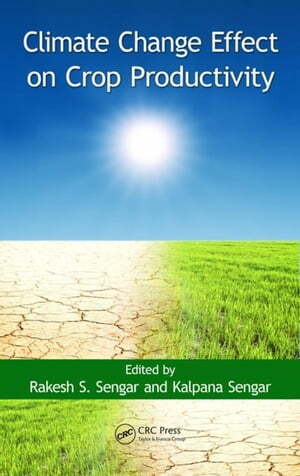 Collins Booksellers - Climate Change Effect on Crop Productivity by Sengar, Rakesh S., 9781482229219. Buy this book online. Agricultural sustainability has been gaining prominence in recent years and is now becoming the focal point of modern agriculture. Recognizing that crop production is very sensitive to climate change, Climate Change Effect on Crop Productivity explores this timely topic in-depth. Incorporating contributions by expert scientists, professors, and researchers from around the world, it emphasizes concerns about the current state of agriculture and of our environment. This text analyzes the global consequences to crop yields, production, and risk of hunger linking climate and socioeconomic scenarios. The book contains 19 chapters covering issues such as CO2, ozone on plants, productivity fertilization effect, UV (ultraviolet) radiation, temperature, and stress on crop growth. The text discusses the impact of changing climate on agriculture, environment stress physiology, adaptation mechanism, climate change data of recent years, impact of global warming, and climate change on different crops. It explores the overall global picture in terms of the effect of crops to climate change during abiotic stress and considers strategies for offsetting and adapting to ongoing climate change.